Text of my talk at the Launch of FACE [9/06/2018] outlining the initiative’s visions and aims. Welcome. From the foothills of the Savannah mountains in Kogi state Nigeria. I say Okun. Ka bi se ri? In this UN decade of people of African descent, I say a greeting and a blessing for every town and city and village in which we the people of African descent are found. May the land beneath our feet welcome us. May our minds be at peace. May our hearts be at rest. The University of Bristol International office. For putting money into this vision, for putting flesh on the bones of an idea. Thank you to both Caroline Baylon and Eleanor Briggs. Caroline for believing this can be done and Eleanor for her ideas, enthusiasm and attention to detail. To the Law school leadership and every member of staff… a massive thank you for the financial, moral and intellectual support. To every member of Organising Committee, many who are students of the Law School, you put your body on the line for what you believe in. I am super proud to have worked with you. May you go far. To many of the speakers, all of who jumped at the chance to be involved with FACE, without hope of remuneration or reward. You have given your time and your expertise and your passion for our community. I appreciate it. We Thank you! To the Lord Mayor, who has been so enthusiastic and willing to be a part of this. You are lending your voice and power and position to us. We feel heard. We feel valued. Thank you. To colleagues, family and friends and everyone who urged us on, many of you could not be here with us today, we are separated by oceans and lands and skies but united in heart and vision. Thank you. To everyone here. Welcome and thank you for giving your day to us, for believing in this vision enough to travel from down the road and across the country. Thank you. Without all of you, today would be a distant dream, left unfulfilled. There is no us without you, there is no FACE without you. Ubuntu. We are because you are. Why did we set up FACE? Locally, nationally and globally, the Pan-African community is on the receiving end of some pretty grim statistics. Recently, a race audit was done in the UK. It was found that 1 in 5 children in Black households compared to 1 in 10 White British households were in persistent poverty. 1 in 10 adults from a Black, or Mixed background were unemployed compared with 1 in 25 White British people. Housing is substantially lower among African, Arab, and Mixed White and Black African households. The households that are most likely to rent social housing were headed by someone in the African, Caribbean, Other Black Background. Despite being extremely multicultural, according to Runnymede Trust, Bristol is the most racially segregated core city in the UK. According to World Bank Data, except for 3 countries all the poorest countries in the world are Pan-African. Those in next poorest category are mostly Pan-African. No Pan-African country is considered to be among the richest countries in the world. Locally. Nationally. Globally. We often hear said that information is power, and how the truth shall set us free. Which would lead us to be believe that if knowledge liberates, then we should find our salvation in educational institutions, especially in universities. But the statistics around Pan-African people in universities in the UK can give us cause to pause. To summarise the statistics, if you are African or have an African heritage, you are unlikely to get into a good university, more likely to not complete university even if you manage to get in, less likely to get a first or a 2:1, less likely to be represented either in terms of content of study or in academic staff, less likely to get a job after university, highly unlikely to teach at a university and more likely to be subject to racism (direct or institutional). Like I said. Pretty grim. What should we do when faced with what seems like an insurmountable situation. So, my question is: who do we become in the face of despair? The first salesperson? Or the second. What do we do in the darkness? Lament the absence of light or BE the light? What is FACE doing about this? FACE is saying enough. Knowledge IS power. We have the power to change things. FACE’s focus for change is on Research, Careers, (Employment, and Entrepreneurship), Education and Academia. And those are the places where we want to see change. Establishing and strengthening staff and student links within the university, Bristol, nationally and internationally: FACE aims to take advantage of the various Pan-African research interests within the university and encourage interdisciplinary research and networking. It is an avenue to showcase this research to students to give them an idea of what they could do within academia. It will also encourage community involvement in research. Creating a programme of events and endeavours across the year focused on the Pan-African ideal: Black students within the university often suggest that they find very little within the university which speaks directly to their experience of being black. FACE will form part of a sustained narrative in reversing the isolation and exclusion black students experience. Establishing links with the black community in the city of Bristol: FACE wants to take a positive step in bridging the divide between people living in Bristol city and the University of Bristol. Addressing the attainment gap: In addition to the attainment gap, non-completion rates and dissatisfaction levels are relatively higher among black students. Some of the solutions that have been suggested to improve that include: working with black students as collaborative partners, recognition of the black student voice as an important facet in improving the attainment gap, encouraging black students as conference participants etc. FACE incorporates these suggestions into its framework. A Pan-African conference focused on students and located within a Russell Group university is a step forward in ensuring black students are not being left out of the conversation, that they have a central place in the education structure and that their careers goals can lie within academia. Addressing the relative lower employment rates of black students: FACE aims to encourage innovation and enterprise – to inspire students to self-actualise. This is why the planning of the conference is placed in the hands of the students, with some oversight. This is to encourage students to develop non-academic skills such as teamworking, organisation, timekeeping etc. The conference is also an opportunity to network, especially with organisations, businesses and establishments that may be of particular interest to black students. The focus on research is also to encourage black students to do research degrees and enter into academia and similar research occupations. Very soon we will announce the criteria for entering the Innovation and Enterprise Award. A competition that will require groups of entrants to devise a solution to a Pan-African problem. We have a few sponsors for prizes, but would love to hear from more. By next year, we will have an extended programme that will include a careers section. We are especially keen on helping students work in Africa either long or short term. 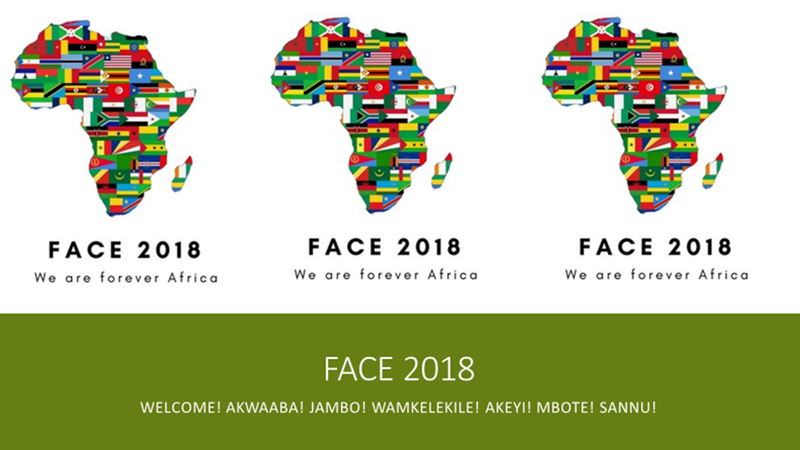 Celebrating Pan-African identity: FACE recognises itself as part of marking the International Decade for People of African Descent, proclaimed by General Assembly resolution 68/237 and to be observed from 2015 to 2024. It is essential to our self-actualisation that our identity is celebrated and not merely tolerated. Tolerance suggests putting up with the intolerable. But we are forever Africa. So yes, we want those statistics to change. But we must remember that the measure cannot become a goal. The essence of change is a full realisation of Pan-Africanism. We are forever Africa. Pan-Africanism was born out of the dreams of people like Edward Blyden, Marcus Garvey, W. E. B. DuBois, Malcolm X, Mwalimu Julius Nyerere, George Padmore, Langston Hughes, Paul Robeson, Kwame Nkrumah, Jomo Kenyatta, Léopold Sedar Senghor, Aimé Césaire and so many, many more. Pan-Africanism is the belief that African peoples, both on the African continent and in her Diasporas, share not merely a common history, but a common destiny. Our common history is undeniable, but thus far, we have been unable to figure out how to together forge our common destiny. We have lost the ubuntu spirit of our ancestors. We have forgotten who we are and who we were. Ubuntu. Umuntu ngumuntu ngabantu – A person is a person because of people. We are ujamaa. We are one African family. Together, we are Ọmọlúàbí. People bettered by community to build a better African community. Umunna bu ike, together we have power. Together we are Africa. Together we are free. Beautiful words from a man whose silent resistance has been louder than the hate that surrounds him. Love as resistance is most powerful when it is expressed, shared. Love dies in darkness. Love dies in a vacuum. Love dies alone. But love that is shared is the most powerful force in the world. It keeps us alive. Despite it all. It gives us the courage to believe in the impossible things we must do together. Pan-Africanism is also joy. Shared joy in our pan-African identity. So, I think that we must dream new African dreams. We are often considered to be a people shrouded in night. A people on the edges of humanity. The individual and collective crises of Africa and her diasporas are reflexively attributed to a construction of Africa as an ‘absolute other’; our gaze of Africanness is seen through its representations rather than its substantiation or any engagement with black humanity or our lived experiences. These false representations confine our collective memory to one of absolute night, forgetting the existence or possibility of sunrise. Of sunlight. Of a perpetual African dawn. So, we must dream new African dreams. As T.E. Lawrence’s quote says, we must dream in the day, and then we must act. ACT! We must act with open eyes, we must make our dreams of a new Pan-Africa possible. We must disrupt both the narrative and the reality. We must start by questioning accepted truths and rejecting them. We must MAKE a new Africa possible. There are many who have tried before us, the struggle was hard, but we must not give up. We must continue from where they stopped. Let us focus on how right it is to do the impossible. Not on how impossible it is to do what is right. And do it with love for each other and with joy in our existence. Because of all the sorry statistics and not despite them, because joy is necessary. Joy is disruptive. Joy has subversive power. Joy refutes impossibility. Joy looks at impossibility in the face and commands it to back down. Because joy is unpredictable, is unexpected when it confronts despair. Joy unveils the true nature of the impossible. Because how do we define impossible? We define it not as something that cannot be done but as something that has not yet been done. So, let us be dangerous. Let us be dangerous to the darkness. Let us disrupt the darkness. Let us dream new African dreams. Let us dream them now. Let us dream them together in love and joy. And let us act. Now. Let us act with conviction. With self-belief. Without hesitation. Together. We are forever Africa. 6% of Black school leavers attended a Russell Group university, (12% of Mixed and Asian school leavers, 11% of White school leavers). 76.3% White UGs received a First/2:1 degree; 60.3% ethnic minority undergraduates 46.2% Black male undergraduates. 13% of Black school leavers attended a top third HEI, 19-20% of Mixed or Asian; 15% of White. Black, Asian and minority ethnic workers with degrees 2½ times more likely to be unemployed than White graduates. 11.1% of Black students dropped out, [12.8% Black Caribbean] 6.5% White; 4.5% Chinese; 4.9% Asian Indian. 42% of Black students believe feel their experiences are not reflected in course content. 2007-8 107th ranked London Metropolitan University had almost as many black students as the 20 Russell Group Universities all together. 55.8% Black African graduates employed 6 months after graduation, 50.4% Black Caribbean, 63.1% White, 64.3% Chinese. Very little improvement 40 months after graduation. 25% of all BME students study at 30 universities. Institutional average is 16%. Black Caribbean 7% points lower offer rate from Russell Group universities, 4% points lower from both other Old and New universities. Black women achieve the lowest percentage of 1sts 5.7%. 6.9% Black men, 18.3% White women, 19.4% White men. 1.1 % of British born academic staff are Black, 0.4% of British born professors. 92.39% of professors (15,905) are White, 0.49 per cent (85) are Black, 24 of those are women. 15 Black academics in senior management roles in the UK.